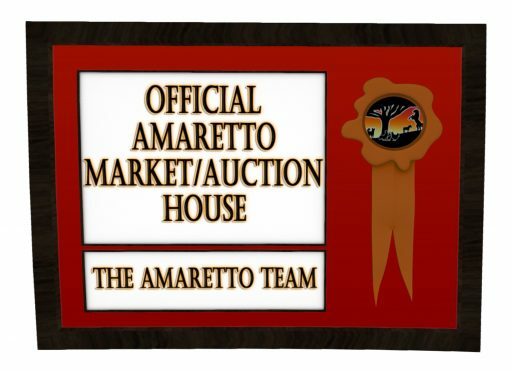 Official Amaretto Market/ Auction House! Hello everyone I am sooooo excited to tell you about a project that we have been working on with a few market owners and we want to extend it to all market owners and auction houses! We are rolling out a new exciting program starting TODAY! We have been working with the markets that all have Amaretto Satellite location to come up with a guideline of standards for everyone to follow! So keep an eye out for these signs! What does this mean? Well we have taken into consideration all the comments made at the breeders round table, suggestion note cards and tickets. Things that are important to you our breeder and community. We are currently working on a page on our website to list all Offical Amaretto Markets/Auction Houses along with their auction times! To have an Amaretto satellite store you must be an Official Amaretto Market./ Auction House. This is a new and exciting way that we hope will get buyers and sellers both to be happier with the 3rd party market! If you would like your Market/Auction house to become av Official Amaretto Market./ Auction House please send a notecard to Avalon Crystal. As for the official ~Amaretto Advertising Network~ which is owned by Amaretto we will follow the same standards as all Official Amaretto Market./ Auction House. I really think that this is an exciting thing for all Owners to become a part of, its our way of supporting them and them support us. Amaretto can not tell you what to sell or what not to sell for but I believe this will be the start of bring all sims and auctions to the same base standard so please check out your rental and see if it is an Official Amaretto Market./ Auction House. I know some of you will have questions and really its simple know the rules where you rent and be sure to follow them and you will have no problems!